TESS will survey the sky in a series of thirteen observing segments, each 27-days long. It will spend the first year on the southern ecliptic hemisphere and the second year on the northern ecliptic hemisphere. 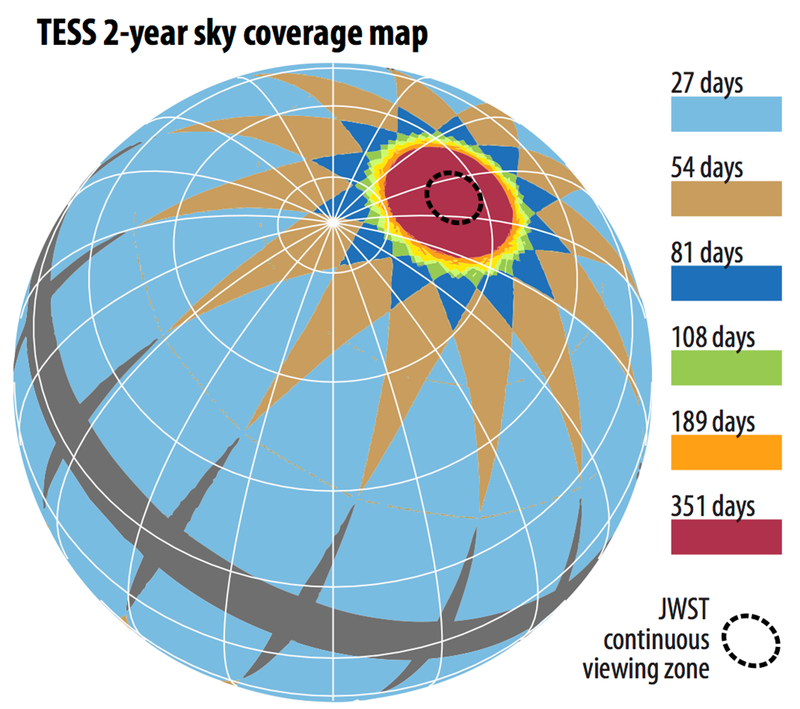 Depending on sky position, TESS targets will be observed for a minimum of 27 days up to a maximum of 351 days. The sequence of simulated images below illustrates the wide field of view of one TESS camera. A TESS segment refers to four camera’s worth of data, covering 24 x 90 degree field on the sky. For a sense of scale, the constellation Orion fits entirely within one TESS camera field of view. TESS will expose at a cadence of 2 seconds. The 2-second data will be used for spacecraft guiding, but they will not be downloaded to the ground. For a few very bright asteroseismology targets, the pixels in little postage stamps surrounding the star will be downloaded at 20 second cadence. This is to maximize sensitivity to detecting short-period oscillations in stars. The core planet search star sample will consist of 200,000 stars, over the whole sky. These are primarily nearby dwarf stars. Pixels in postage stamps around these stars will be downloaded at 2 minute cadence. short enough cadence to help resolve the ingress and egress for many of the brighter planet candidates. Finally, every single pixel that TESS observes will be downloaded at 30 minute cadence. This uniform dataset will allow general variability studies for the (vast majority) of stars that might not make it into the postage stamps.